Now you can eat comfortably, have a pleasant conversation, laugh and talk with confidence. 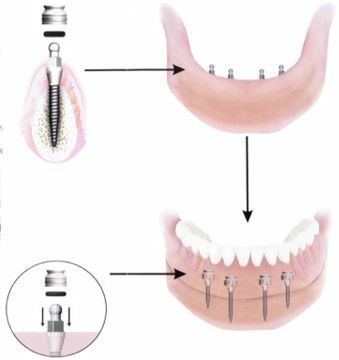 The Mini-Implant System, allows Dr. Willis to place implants in as little as one day. Titanium implants act like roots of a tooth to retain and hold your lower denture. Our Ultra Advanced Dentures are recommended as the best choice when utilizing mini implants. A one year warranty against breakage, along with no charge adjustments are provided for the lifetime of these dentures. Now, you can relax and feel confident, knowing that your denture is secure and held firmly in place.